By Sister Barbara Anne Hallman O. S. F.
Sister Barbara Anne is a Christian very much in love with God; a woman very much in love with life; a Franciscan very much in love with nature. Sister has spent years joyfully and compassionately serving the elderly sisters of her community. She is a member of a loving family who taught her the importance of treasured friends, of which she has many. Sister's contagious laugh and ever present humor have led her to be a great storyteller. Her gift of tears has led her to be an attentive listener. The combination of these characteristics have given Sister the ability to lead others into deep introspection and contemplatiion. Sister Barbara Anne uses her love of scripture, her gift of creativity and her openness to others to direct group and private retreats, to speak at various conventions, and to be a spiritual companion. Sister's personal friendships with many of the elderly sisters have made the writing of her book a joy, a personal journey, a reflection on the challenges of aging. It has also strengthened the values she has learned from these holy women. Sister Barbara Anne now resides at Our Lady of Angels Convent in Mishawaka, Indiana. When she is not engaged in prayer or study one may find her reading, painting or working with stained glass. The richness of her life experiences, her willingness to reach out to others are captured in Hands That Hold Hearts. 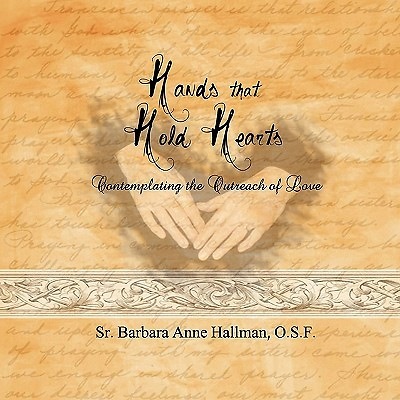 Author: Sister Barbara Anne Hallman O. S. F.